GSL® K2.6 gypsum cement is an underlayment designed to provide code compliance in wood and concrete UL fire rated assemblies. It is listed on numerous UL designs and has been shown in laboratory testing to provide compliance with IBC standards in impact noise (IIC, ASTM E492) and airborne noise (STC, ASTM E90). Pumpable, GSL delivers high strength, good water resistance and outstanding performance when placed after drywall in typical multi-family projects, while in some instances prior to drywall. GSL allows for light foot traffic shortly after placement. Applications from 0.375” up to 3” depth can be achieved in a single pour. GSL remains placable for nearly 30 minutes, yet will withstand light foot traffic at any depth in about 90 minutes. This product offers high density, yet has less finished weight and more flexibility than portland cement self-levelers. Unlike portland cement, gypsum does not shrink and requires no hand finishing tools other than a darby that establishes thickness and uniformity. Typically installed with a specialty mixing machine capable of placing 20,000 to 30,000 square feet per day. GSL K2.6 is specially formulated to add mass to a floor ceiling assembly and help control airborne noise. GSL is UL approved on all standard assemblies providing developers the fire safety assurance required in today’s multi-family projects. GSL is designed for installation by trained contractors from DEPENDABLE, LLC. Please consult with a local representative for a list of contractors in a specific geography. • Building must be fully enclosed including doors, windows and roof. • Interior ambient temperature must be 50ºF at least one day before installation and maintained at “a minimum of” 50ºF temperature for a minimum of 4 to 5 days after installation. • Adequate ventilation must be maintained until the moisture in the gypsum has been allowed to evaporate. This requirement is typically a minimum of 5 to 7 days, but may be longer depending on thickness of underlayment, humidity and conditions in the local environment. • Subfloor must be a minimum of L/360, broom swept with all excess wallboard mud removed and all holes patched. • Wood construction must be with tongue and groove subfloor (OSB orplywood). • For installation on concrete substrates the subfloor must be fully cured (minimum 28 days). Moisture tests should be performed to assure proper hydration under ASTM F1869 to assure MVE level is less than 3.0 lb. per 1000 square feet. • For below grade applications or over a crawl space, vapor barriers must be applied. Subfloor must be properly primed. Use GSL PRIMER on all surfaces. Approvedpriming methods include: roller, soft bristle broom, brush or spray. All supporting surfaces shall be structurally sound, solid, free of movement and well bonded. They shall be dry, free of dust, oil, grease, tar or other contaminants that mayact as a bond breaker. Deflection cannot exceed L/360. Dilute GSL Primer before application. Dilute 1 part GSL PRIMER concentrate to 4 parts potable water (1:4). Using a long handle roller, soft bristle broom, brushor sprayer, apply GSL PRIMER at a coverage rate of 270-320 sq. ft. per gallon ofprimer solution. Coverage rate varies depending upon surface porosity. Ensure a complete and uniform coverage. Allow to become very tacky or dry (about 1 hour). Follow DEPENDABLE, LLC guidelines and specifications. GSL is only to beinstalled by trained contractors approved by Dependable, LLC. Plywood, OSB, concrete, precast concrete and approved acoustical treatment are acceptable. Wood substrate must be proper thickness, tongue and groove construction and properly fastened. Concrete should be clean, dry and free of obvious structural problems. 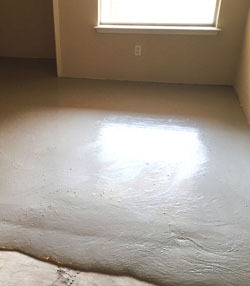 All substrates must be properlysealed and/or primed before the GSL floor underlayment is applied. Material should be kept in a dry area. Avoid ambient temperaturebelow 50°F and above 110°F for prolonged periods. Shelf-life of sixmonths. • Multiple lifts: Multiple lifts may not require a primer with GSL. Second lift can be accomplished upon an initial set that can handle the load of the hose operator and finisher. NOTE: Temperature and humidity levels affect the drying characteristics of GSL. However, unlike Portland cement materials, GSL may be force dried with the use of heat or fans once set. • DO NOT USE IN EXTERIOR APPLICATIONS. For Interior use only. • GSL is NOT a wear surface. • DO NOT INSTALL WITHOUT TONGUE AND GROOVE SUBFLOOR unless utilizing back bracing or lling all joints. • ASSURE BUILDING IS COMPLETELY INCLOSED including doors, windows and roof. • INSTALLATION TEMPERATURE MUST BE 50ºF and rising. • PROVIDE ADEQUATE VENTILATION after placement of GSL until dry. • Where hydrostatic pressure (water) is present or moisture emissions exceeds level permitted for installed floor covering. • Where surface or ambient temperature falls to or below 50°F 72 hours before or after installation. • As a trowelled patch or at less than natural minimum flow thickness. • Exterior, exposed applications or as a wear surface.